When I was going to LAN, I found a village with a Torch Post and I found a dropped torch and missing torch on the black wool. Torches in mineshafts generate often dropped or without a supporting block. Most of the torches which are at valid places are attached to the naturally generated block which remained (for example stone), only a few are attached to wooden planks. MC-60333 Found a torch broke in village. 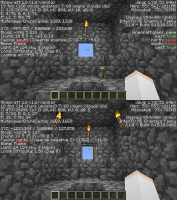 MC-67993 Portal to Overworld created by EnderDragon don't create torchs anymore. MC-82233 End exit portal doesn't create torches!